The collapse of the Doha oil talks couldn't hold back the Dow Jones Industrial Average today. Traders found support from news of a strike by Kuwaiti oil workers that will reduce the nation's oil output by more than 50%. But we know that this strike won't be short-lived given the importance of crude supplies to Middle Eastern economies. Despite a downturn in the tech sector Tuesday, the Dow rallied on the back of rising crude oil prices. WTI crude increased by 3.1% on the day, while Brent crude added 2.5%. Here's what else you need to know about the markets on April 19, 2016. 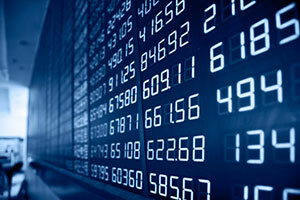 The financial sector continued to show weakness as trading volumes decrease. Financial firms are also no longer benefiting from the U.S. Federal Reserve's quantitative easing program. This morning, Goldman Sachs Group Inc. (NYSE: GS) reported its weakest revenue levels in four years due to weakness in its bond trading and investment banking divisions. Still, GS stock added 1.5% because the bank beat such weak expectations. Expectations for Goldman were so low that just the fact that they beat earnings helped push up shares of Bank of America Corp. (NYSE: BAC), JP Morgan Chase & Co. (NYSE: JPM), Morgan Stanley (NYSE: MS), and Wells Fargo Co. (NYSE: WFC), all of which increased by more than 1%. Merger and acquisition activity hasn't dried up for these banks. According to Reuters, Bass Pro Shops – which is privately held – is working with the private-equity division of Goldman Sachs to make a play for hunting and fishing retail giant Cabela's Inc. (NYSE: CAB). Shares of CAB added more than 7% on the news. Corporate defaults are happening at the fastest pace since 2009. Energy firms continue to collapse, with the latest today being Seventy Seven Energy Inc. (NYSE: SSE). Shares fell 77% on the news that the firm plans to file for Chapter 11 bankruptcy next month. In a preplanned bankruptcy deal, the firm plans to turn $1.1 billion in debt into equity and operate as normal. But the big story today dealt with the Affordable Care Act. UnitedHealth Group Inc. (NYSE: UNH) shares added 2% after the company beat earnings expectations and increased its forward guidance for its first quarter. However, the company announced plans to leave numerous Obamacare exchanges and only remain in a handful of states. The news will only accelerate the death spiral for Obamacare. On the economic front, UnitedHealth announced that it expects to lose $650 million this year on its exchange business. That's up from its $475 million loss in 2015. Rising oil companies helped out smaller energy companies today. Devon Energy Corp. (NYSE: DVN) shares climbed 4.5%, while Noble Energy Inc. (NYSE: NBL) added more than 5.5%. Meanwhile, shares of Chevron Corp. (NYSE: CVX) added 1.2%. The Nasdaq was hit hard by a 22% decline in shares of Illumina Inc. (Nasdaq: ILMN) after the diagnostic test maker announced poor earnings expectations for the current quarter. The company also received a downgrade from Cantor Fitzgerald. Netflix Inc. (Nasdaq: NFLX) stock slumped more than 12% after the company reported weak subscriber growth and lowered expectations for investors. The firm said that it only anticipates 2.5 million new subscribers, which would be the lowest amount of quarterly growth for the firm since 2014. On the earnings front, shares of the railroad operator Kansas City Southern (NYSE: KSU) added more than 3% after the firm beat earnings expectations for the first quarter. Meanwhile, shares of International Business Machines Corp. (NYSE: IBM) fell more than 5% – far short of Wall Street expectations due to weakened software sales. Shares of several mining companies were up sharply after gold prices rallied more than 1.5% and silver prices added 4.3%. Shares of Freeport-McMoRan (NYSE: FCX) were up roughly 7%, while Newmont Mining Corp. (NYSE: NEM) stock was off 4%.